eCite - Supporting rural ageing well: how important is the rural? Supporting rural ageing well: how important is the rural? 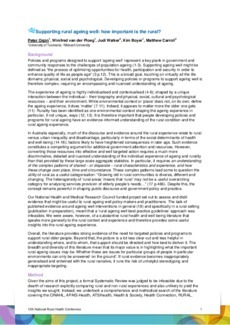 Background and objectives: Policies and programs to support ageing well form a key plank of government responses to population ageing. Such interventions need to be context sensitive because place matters in ageing and living rurally is likely to shape a particular, if not unique, ageing experience. Our project sought to examine the evidence base available to policy and practice developers seeking to support ageing well in rural contexts. Method: A highly structured search of the literature to inform an understanding of the particularities of the rural ageing experience yielded a final sample of 163 papers. Results: Large scale, statistical studies reveal a clear pattern of aggregate ruralversus-urban inequality across a range of measures likely to impact the rural ageing experience. However, a large, eclectic body of smaller-scale, qualitative and semi-quantitative studies reveal that these broad statistical generalisations gloss over huge diversity in rural context, condition and experience, as well as complex and changing distribution patterns of advantage and disadvantage. They reveal that the rural ageing experience will ultimately be a unique product of the interaction of an environment and the resources an individual or group bring to dealing with that environment. Discussion: Robust but blunt statistical rural-urban comparisons provide strong support for claims for government resources to address rural, especially rural ageing, issues. However, because they gloss over diversity and difference, they are of limited help in understanding complex patterns of advantage and disadvantage and, therefore, in deciding how to most effectively and appropriately target those resources. The more nuanced evidence provided by more discriminating studies do support some broad general understandings of the likely nature of rural character, cultures conditions and issues but at the same time highlight the need to treat these simply as starting points and guides to the questions that need to be asked and answered with more detailed local evidence. Conclusion: The rural context is too diverse and fast changing for definitive characterisations of rurality. The incomplete and ever-evolving picture emerging from a multitude of small studies provides some generalised understandings and a good starting point but without rigorous testing in the local context, these studies carry the risk of unhelpful stereotyping leading to inappropriate targeting of resources. Policy recommendation: Government and services providers need to move beyond broad generalisations concerning rurality and ageing and devote more time and attention to unravelling and understanding the complex patterns of advantage and disadvantage in non-urban populations.